Both features are fast in extraction (the second one naturally being faster as it does not investigate the neighborhood) and yield nice, visually very similar results in search. See also the image below showing 4 queries, each with the new features. The first one of a pair is always based on JointHistogram, the second is based on the OpponentHistogram (click ko see full size). I also changed the Histogram interface to double as the double type is so much faster than float in 64 bit Oracle Java 7 VM. Major bug fix was in the JSD dissimilarity function. So many histograms now turned to use JSD instead of L1, depending on whether they performed better in the SIMPLIcity data set (see TestWang.java in the sources). Finally this just leaves to say to all of you: Merry Christmas and a Happy New Year! This entry was posted in Dev, General, Java, Software and tagged cbir, Imaging, Java, Lire, OpenSource, Release, Retrieval on December 21, 2012 by Mathias Lux. While writing a scientific paper on tag recommendation I checked – just out of curiosity – the share of images tagged by their uploaders on Flickr. 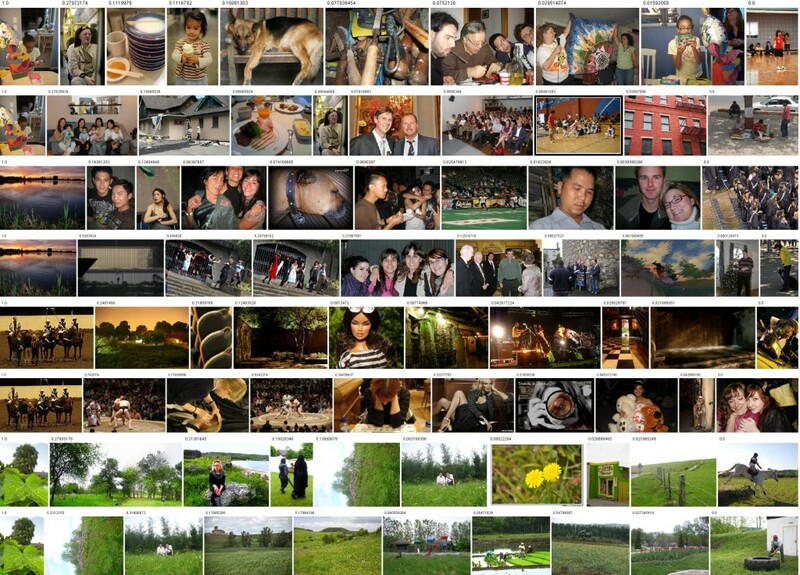 I found out that 4 out of five images are untagged and that less than 15% of images have 2 or more tags. With alpha=0.99 p1 is in [16.84, 19.66]. That leaves more than 4 out of 5 images untagged. With alpha=0.99 p2 is in [11.9, 14.37]. That means that less than 15% of the images images have more than one tag. This entry was posted in Tagging, Web2.0 and tagged Development, flickr, Imaging, stats, Web2.0 on July 3, 2008 by Mathias Lux. In the morning I was listenting to the talk of Horst Bischof on robust people detection in surveillance scenarios. In my opinion he gave a great talk: He manages to show the nature and results of their research and motivate the usefulness and significance of results based on context and related work. He points out what the achievements are and what hasn’t been touched by his research group and why. He also visualized his results using videos which was appreciated by the audience. If I findout where the videos can be found I’ll blog the link. This entry was posted in Conference, Research, Science, Workshop and tagged Conference, detection, Imaging, Research, Science, surveillance on May 7, 2008 by Mathias Lux. The 9th International Workshop on Image Analysis for Multimedia Interactive Services (WIAMIS) takes place for the next three days in Klagenfurt, Austria. As we (the Multimedia Metadata Community) organized a special session there we will gather on Thursday latest and discuss current and upcoming research topics. While I still have some things to prepare for tomorrow I will visit Horst Bischof’s keynote talk on “Robust Person Detection for Surveillance using Online Learning” and I hope I will find some time to blog about the conference. This entry was posted in Conference, Multimedia, Science, Workshop and tagged Conferences, Imaging, Multimedia, Research, Scientific, Visual on May 6, 2008 by Mathias Lux. This entry was posted in Imaging and tagged art, Fun, Imaging, scattered on February 26, 2008 by Mathias Lux.